The great master Li, Jing-Lin was the 10th generation lineage holder of Wudang Dan Pai Wudang Sword, and the 1st generation lineage holder and founder of Wudang Free-Step Taijiquan. He was a career military man, and for many years was the general of his own armies stationed in Tianjin. Grandmaster Li was famous for his Wudang Sword techniques, which were both stunning to watch, and brilliant in application. 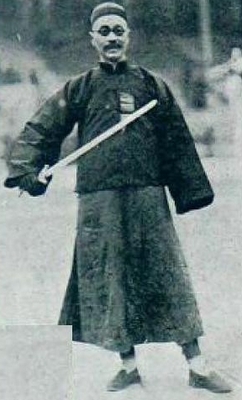 He learned the original Wudang Sword from his master, great master Song, Wei-Yi, but later combined those techniques with various other sword forms and martial styles to create his own unique system. He grew wide acclaim for his enthusiasm to learn from others by inviting swordsmen from all over China to come to his home for friendly duels. After winning so many bouts, people took great notice of Grandmaster Li and began calling him “Immortal Sword” Li. Grandmaster Li, Jing-Lin was passionate about martial arts and learned or was exposed to many various styles and systems. It was because of his vast experience in the field of Chinese Gong Fu that he was able to create Wudang Free-Step Taijiquan. He used the Yang Style Taiji that he learned from the 2nd generation lineage holder of Yang family Taiji, great master Yang, Jian-Hou, as the basis for his new system. Later he combined stepping and intent from Xingyiquan and Baguazhang, with the grace and movement repertoire of Wudang Sword to create a new system. Grandmaster Li, Jing-Lin was an innovator. He used his knowledge to work tirelessly to try and create a whole system for Wudang Dan Pai which included various hand and weapon forms and fighting with the original component of Wudang Sword. Throughout his career he had many great accomplishments both on the battlefield and in the martial arts community. Grandmaster Li, Jing-lin was responsible for forming many martial arts schools and institutions. One of the most famous was the Nanjing Central Martial Arts Academy. It was in this academy that Grandmaster Li enlisted many famous martial artists from around China to teach the curriculum. This academy was such a success that its design was copied in several other big martial arts schools in other provinces. Grandmaster Li, Jing-lin was extremely famous in his time and was constantly being followed by people who wanted to become his disciples and learn from him. Grandmaster Li saw this as a great chance to spread the art of Wudang Dan Pai, and so took many disciples during his lifetime, eventually totaling out to more than 200 people. However, Grandmaster Li was not necessarily overreaching by doing this. Traditionally there were three levels for those who wanted to train in martial arts. The first was simply being a student, which consisted of following the movements of others and being taught only by senior students. The second was disciple, which meant that you were allowed to train with senior disciples and the master, and you would be exposed to the true forms and teachings of the system. The last level was inner-door disciple and this level was given only to a select few or, in some cases, to just one person. This level meant that you would have to learn all the techniques in the system, including the secret techniques, so that you would be able to pass the system on to the next generation. Only a select few were taken as inner-door disciples of Grandmaster Li, Jing-lin. Grandmaster Li is directly responsible for the notoriety that has been given to Wudang Sword and Wudang Dan Pai. He was one of the greatest masters of the late Qing Dynasty and early 20th century, and one of the top masters of Wudang Dan Pai.